Thank you Craig for your reply. As it was the first time I had ordered with you and as it was at the theater group's suggestion and also since I had ordered well in advance, I never thought to ask, but I appreciate knowing for the future. You products really are very nice and all the kids looked great in their costumes - I would definiately recommend your site to friends for all the color choices you offer! By the way, the person I spoke to on the phone that day asked if I'd send in a picture in exchange for arranging for the overnight shipping. 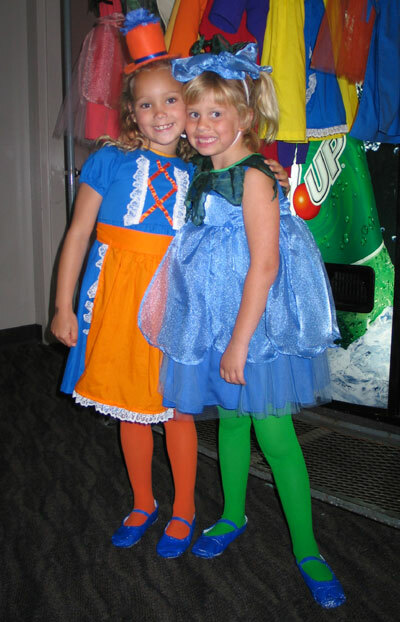 I'm attaching a photo of my daughter Colleen (on the right) and her fellow Munchkin in "The Wizard of Oz." As you can see, they are both wearing your tights and under Colleen's costume she is wearing one of your leotards that match her dress. Enjoy! Send Us photos of your munchkin costume complemented with We Love Colors tights.